Competition is good and Amazon has taken a big step forward in making their online music more competitive with iTunes with the remaking of the Amazon MP3 Store, which is now optimized for Mobile Safari and iPhone, iPod touch and (wiggle a little) iPad. No, you still can’t purchase music directly within Amazon Cloud Player for iOS — Apple requires a 30 percent cut of each sale for that to happen — but playing, organizing, syncing, etc. music is much, much easier. 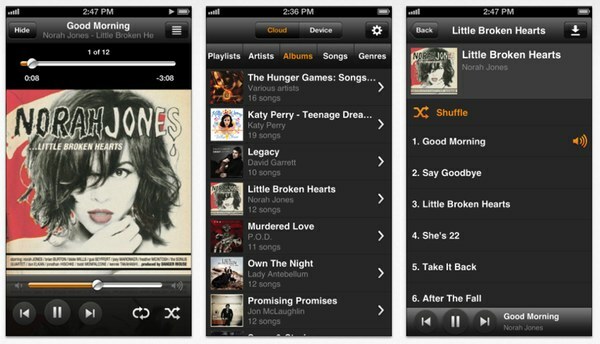 Listen to your music from the cloud on your iPhone or iPod touch anywhere you are with Amazon Cloud Player for iOS. You can download or stream your library from the cloud – or play the music you already have on your device. Create and edit playlists, play music in the background, or use Bluetooth to stream your music in your house or car. Buy music from your phone at www.amazon.com/mp3, then play it immediately in Cloud Player, without having to sync or transfer. What’s the bottom line? If you are strongly invested in the Amazon MP3 Store and Amazon Cloud Player for iOS, these moves make storezilla’s ecosystem more compelling. However, for folks like me, who purchase music on both the iTunes Music Store and Amazon MP3 Store, but manage and distribute all of that via iTunes for Mac and iOS, then there’s virtually nothing new to see here. Yes, I can imagine a moment where being able to get Amazon music from the cloud will be a good thing. But reorganizing how I have done things for years, and having to pay for privilege of getting all my music into Amazon, is a non-starter. Apple’s iTunes music ecosystem isn’t perfect, yet it’s far from broken. Further, Amazon’s MP3 Store + Cloud Player + pay-to-play storage system is far from being that compelling.